There are few things as exciting for classic car aficionados than the “barn find.” A coveted car is placed in storage or forgotten for decades, and when the property changes hands or the car’s hiding place is disturbed- these long-lost vehicles return to the classic car world. It is a special occasion to find one of these lost classics- but nearly 500? That’s a vintage car gold mine. According to the New York Times, the collection belongs to Ray Lambrecht of Pierce, Nebraska. He was a Chevy dealer for five decades, and retired in 1996. His dealership didn’t sell any trade-ins and bought its inventory outright. He kept any unsold inventory and stored it, along with any cars he thought would have long-term value. The collection started to grow, and became his retirement plan. The collection includes a 1958 Chevy Pickup with 1.3 miles, a ’64 Impala with 4 miles, and a ’78 Corvette Indy Pace Car Edition with only 4 miles on the odometer. As the years went on the collection grew out of the confines of parking lots and warehouses where they were previously stored. These cars are being auctioned off now that the land they were stored on is being developed. 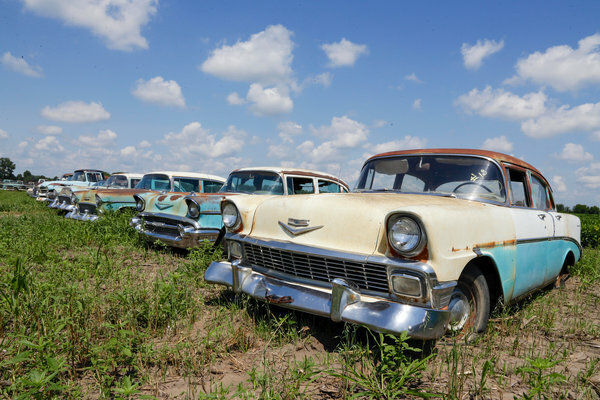 The quote’s from a short article by George Kennedy for Boldride, Nearly 500 Classic Chevys Found in Nebraska. But for the full story see this piece by Peter Salter, In Nebraska, a Field of Low-Mileage Dreams, at the New York Times. Photo via Boldride via the New York Times. Damn, I would love to have that Impala. Very Cool discovery. I saw where some still have the factory plastic over the seating. Now does one take that off or leave it on for future generations?? Its like finding that new in box or NIB 1957 Control Tower washer, do you be-box it and run water through it after so many years in storage or do you keep it dealer original. I am sure we'll see the end result on these cars, it will be interesting.